Hdle obv. floral pattern hdle. BL: bright cut engraved view of "James G. Blaine +Residence, Augusta, ME." 9018-0002. Sterling Souvenir Spoon. Political Spoon. Compliments of the Governor Albert W. Gilchrist. Political Souvenir Spoon. Florida. Monkeys. Florida scenes. Hdle obv. embossed view SS of Florida + embossed oranges + embossed view “Capitol” + embossed view of alligator + pineapple + palm tree. Hdle rev. embossed hotel views: “Ponce de Leon” + ‘Royal Palm. Miami” + “City Gates’ (at St. Augustine) + Spanish soldier. 9018-0003. Sterling Souvenir Spoon. Suomi Finland. Hdle obv. Enameled (red) crown at finial + Roermond lion on red enamel background. 9018-0005-0132d. 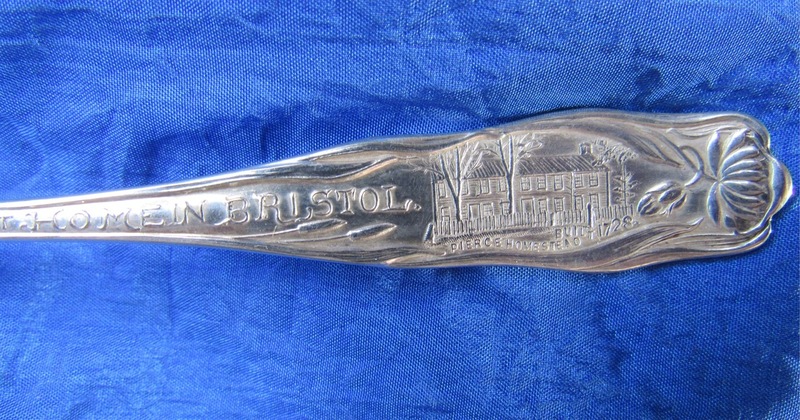 Sterling Silver Souvenir Spoon Advertising Orient Bicycles. Hdle obv: embossed symbols for the Orient Bicycle Co. + chains & gears of the bike + "Leads the Leader"
BL: embossed view of the bicycle with the word "Orient." Retailer: Waltham Mfg. Co. N.Y.
Hdle obv. Coat of Arms of New York State at finial + embossed figure of young Hollander w/ pipe & dressed in old Dutch costume + fancy letter of "Neu Amsterdam" on lower stem. Hdle rev. emb. decorative designs. Hdle obv. embossed view of "Home of Lincoln" surrounded by flowers + ""With Malice Toward None With Charity for All" + framed by flowers. Hdle rev. embossed decorative flowers. BL: embossed view of "Fort Dearborn 1821." Retailer: Spaulding & Co. Chicago. Hdle obv. enameled finial with view of "Dom" in Wien. + "Wien" (enameled) on stem. 9018-0009-0259d. Sterling Silver Souvenir Spoon Washington, DC. Capitol. A Rare Spoon (date = 1896). BL: bold-washed bowl w/ red/blue flag + "Washington, 96." 9018-0011-0871d. Uruguay Silverplate Souvenir Spoon. Hdle obv. embossed decorative design surrounding the coat of arms of Uruguay + decorative stem. 9018-0012-0869d. Hamburg Rathaus 800 Silver Souvenir Spoon. Hdle obv. embossed coat of arms of "Hamburg" (on plaque) + decorative stem. (white enamel stripe on stem = has minor cracks). BL: enameled view of "Rathaus". Bowl Enamel = in mint condition. 9018-0015-0876d. Wiesbaden Neues Kurhaus Enamel 800 Souvenir Spoon. Hdle obv. embossed helmet at finial + blue enameled crest with 3 fleurs de lys + decorative stem. BL: gilded bowl with view of" Neues Kurhaus Wiesbaden." 9018-0016-0875d. Enameled Image Virgin Mary Concepcion (Chile) Gilded Souvenir Spoon. Hdle obv. enameled medallion depicting image of Virgin Mary (on San Cristóbal Hill) in Chile) + decorative stem. Hdle rev. marked "Concepcion" on reverse of the medallion at finial. More about this spoon. Concepción (Spanish for "conception", in reference to the Immaculate Conception of Roman Catholic faith) is the name of several towns and cities. The largest of these is Concepción, Chile, the conurbation of which is home to over one million people. Concepción is also a Spanish female name. 9018-0017-0873d. Norwegian David Andersen Enamel 925 Silver Souvenir Spoon. Hdle obv. reddish enamel feather-like handle. BL: plain. Entire spoon = gold-plated. MK: D.A. (David Andersen) + scales. 9018-0018-0887d. Hamburg 800 Silver Enamel Souvenir Spoon. BL: embossed view of "Die Neue Elbbrucke." 9018-0019-0060. Sterling Silver Souvenir Spoon Capitol Dome Washington D.C.
9018-0020-0455d. Sterling Silver Souvenir Spoon Denver Court House Post Office City Hall Ore Team. Hdle obv. embossed views of "The Cow Boy" + "Court House" + "Post Office" + Miner holding up a nugget and a pick axe. Hdle rev. embossed view of Indian on horseback + "The Long Ago" + embossed views of "City Hall" + "Ore Team." BL: bright cut engraved "Denver." Hdle obv. embossed FF statuette of George Washington depicted as Cincinnatus (with his plow/anchor according to some researchers) + twist stem. Hdle obv. embossed view of "New York" state coat of arms with "Excelsior. New York" + embossed view of Niagara Falls + "Niagara Falls" on lower stem . BL: embossed view of "Masonic Temple. Chicago." 9018-0024-0577d. Providence. Sterling Silver Souvenir Spoon Roger Williams. Hdle obv. embossed view of Roger Williams + "Providence" on lower stem. 9018-0026-0583d. Patrick-Henry. Sterling Silver Souvenir Spoon Patrick Henry St John's Church. Hdle obv. embossed portrait of "Patrick Henry" + twist stem. BL: embossed view of "St. John's Church." 9018-0027-0715d. Fontainbleau. Gorham's Fontainebleau Pattern. Hdle obv. embossed finial in the Fontainebleau Pattern. BL: plain + satin finish. Hdle obv. embossed view of Riding Hood and Wolf + "Little red Riding Hood" on lower stem. MK: Royal Mfg Co. Triple Plate. 9018-0030-0785d. University of Western Ontario Enamel EPNS Souvenir Spoon. Hdle obv. embossed helmet at finial + enameled coat of arms of "Canada" + decorative stem. BL: enameled view of building at "University of Western Ontario." Hdle obv. enameled hdle with view of "Our Lady of the Snows"
BL: bright cut engraved letters: "NCW" [???]. minor scratches in the bowl around the letters. More about this spoon. Devotion to Mary under the title of Our Lady of the Snows is one of the oldest devotions to Mary. It has direct ties to the legend about a marvelous snowfall in Rome in 352 A.D. Mary had indicated in a dream to a wealthy, childless Roman couple that she wanted a church built in her honor and the site for this church would be covered with snow. On a hot, sultry morning on August 5, Esquiline Hill was covered with snow. All Rome proclaimed the summer snows a miracle, and a church to honor Mary was built on the hill in 358 A.D. Restored and refurbished many times, this church, now the magnificent Basilica of St. Mary Major, still stands today as the seat of devotion to Our Lady of the Snows in the Catholic Church. 9018-0032. Sterling Silver Spoon Pin. Classical warrior head at finial with shield below. 9018-0035. Sterling Silver Spoon Pin. 9018-0036. Olympian Pattern Spoon with 17 variations on the handles. Introduced at the Exposition Universelle. Paris 1878. Patent application = filed on May 17, 1898; Patent issued on August 12, 1879. This citrus bowl spoon has the "Diana and her nymphs" scene on the handle. Length of spoon: 6 inches. Hdle reverse = monogrammed at finial end with letters SASE (???). Olympian Variations:  Jupiter with the eagle;  Hebe, the cup bearer;  Paris, the son of Priam;  Venus born of the sea;  Orpheus in search of his wife;  Diana and her nymphs;  Bacchantes amusing the infants;  Hercules and Omphale  The Sibyl  Fourth labor of Hercules  Acteon  Bacchus  Orpheus  Bacchus and Bacchante  Second labor of Hercules  Sleeping Diana  Satyrs receiving instruction. 9018-0002 Vine Pattern (with Gourd design). There is no record of a patent application in the US Patent Office for this Tiffany pattern. The Vine Pattern was first introduced in 1872; it became inactive before 1904; the pattern became obsolete as of February 2, 1934 when the dies were destroyed. 9018-0003. Tiffany's "Bamboo" Pattern. Demitasse spoon.